Young Goldie, now Zoey, was adopted by Basesh Gala. 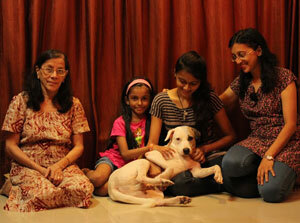 Loving, intelligent and extremely friendly, she thrived with the love showered on her by her new family. A happy part of the Gala household now, Zoey often accompanies Basesh to work, where she's seen enthusiastically greeting all the employees and visitors. 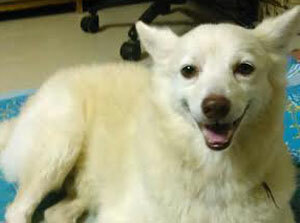 Photon, adopted a year ago, is a 3 year old male Spitz. He was found by WSD during Diwali last year, apparently abandoned and running around the streets of Malabar Hill. Now Danny, he paid us a joyous visit to the kennels a month later, where we were thrilled to see him so well looked after, happy and well adjusted. The entire family dotes on this loving, well trained, healthy boy. "Danny is adorable. He's very friendly with everyone and loves to play. When he wakes me up at 6 am every morning to go for his walk, it sets the tone for my entire day. My life would be incomplete without him. Every day is better because I always have his smiling face in front of me. 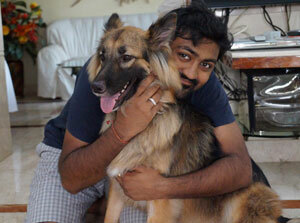 Thank you for coming into my life", says a doting Sanjit. Gentle giant, Moon, was adopted last year. Fully trained, calm, loving and intelligent, he adapted easily to the daily routine and family fun at his new home. Our energetic, lively girl Lily and steady, calm boy Phantom, now Veeru, were the next two to find an amazing home at the Munshi's last year. 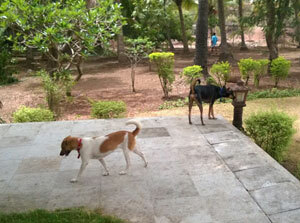 Now with an entire farm to explore, and a family to care for them, these two are happy dogs. "I have been adopting dogs from WSD for several years now. I recently adopted two dogs from them to take to my farm. The representatives and volunteers of WSD are very helpful and friendly and the entire process of adoption was simple and hassle free", says Kirti Munshi.